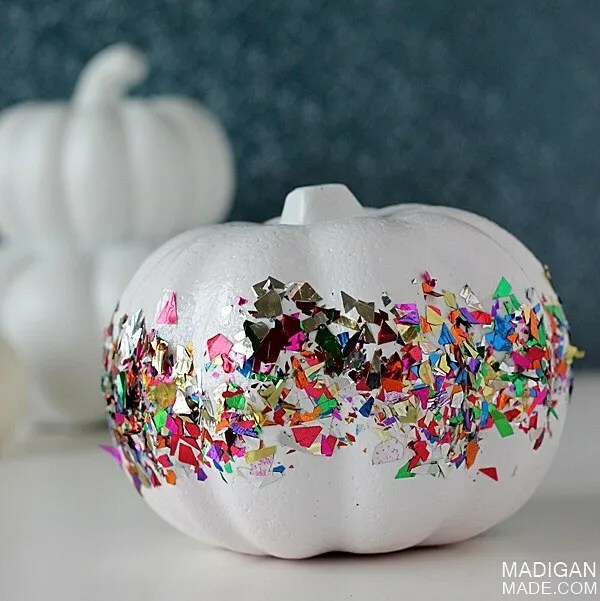 Madigan made… a fun and colorful DIY pumpkin. It’s a slight addiction. I admit it. I love the dollar store. I can’t help it. I’m always stopping in there to see what’s new and seasonal. 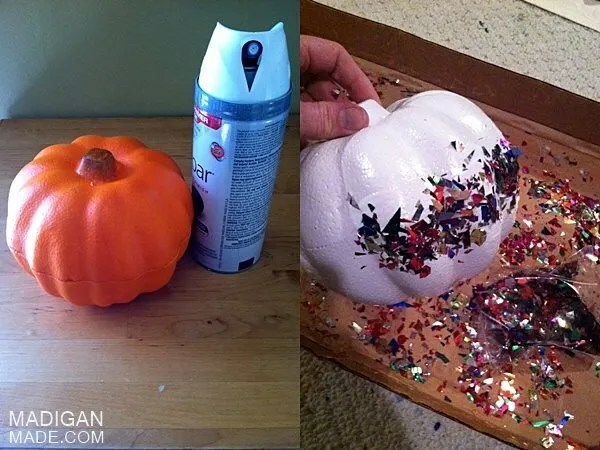 And as a craft blogger, I feel it is my duty to tell you that you can buy big ol’ foam pumpkins there right now! I brought a little guy home recently from the dollar store and wanted to give him a crafty update. As much as I love the black and white theme I have going this year (and the gold and white fall décor in prior years), I kinda wanted to do something different with this pumpkin. Not spooky. Not gilded. Something simple and fun that could work in many rooms in our home. So, I first gave the foam form a coat of glossy white spray paint. Then I grabbed some very colorful, shiny confetti. (Not glitter? I know. Shocker. But, hey, this stuff is still pretty sparkly!) 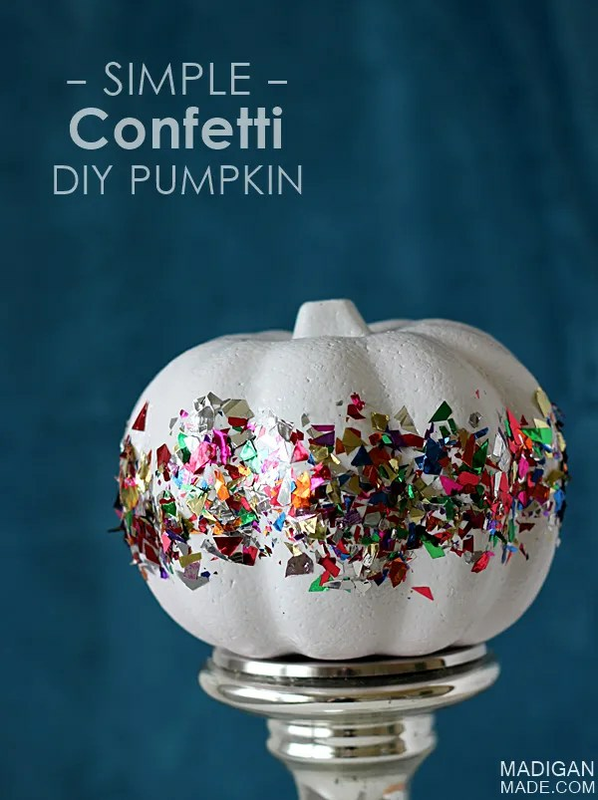 I quickly brushed on a thick band of Mod Podge around the center of the pumpkin. Then, I sprinkled on a liberal coat of confetti. It was a little messy, but I liked that look. Once that glue dried, I went back and brushed another coat of Mod Podge on top of the confetti to help seal and secure it down. I love the way this little pumpkin turned out. Super sparkly and fun. Super easy (and addicting!) to make. 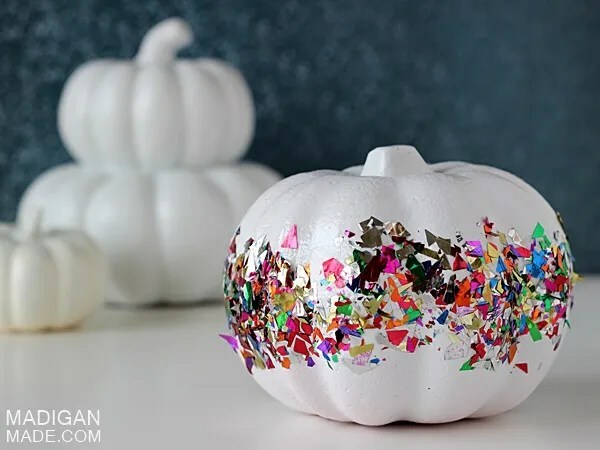 If you share my love for the dollar store, head out and get your DIY pumpkin decorating on this week!